Business processes are highly complex and require considerable effort to coordinate. Managers frequently cite coordination as one of the greatest leadership challenges. The comprehensive or master budget is an essential part of the coordinating effort. 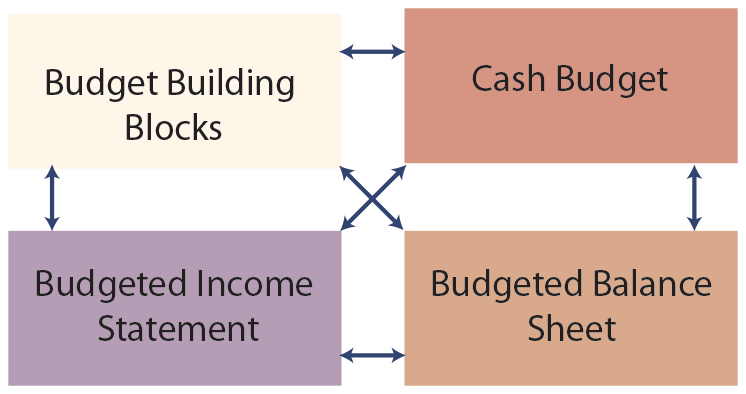 Such budgets consist of many individual building blocks that are tied together in logical harmony and reflect the organization’s financial plan. The base or foundation for the master budget is an assessment of anticipated sales volume via the sales budget. The expected sales level drives both the production plans and the selling, general, and administrative budget. Production drives the need for materials and labor. Factory overhead may be applied based on labor, but it is ultimately driven by overall production. 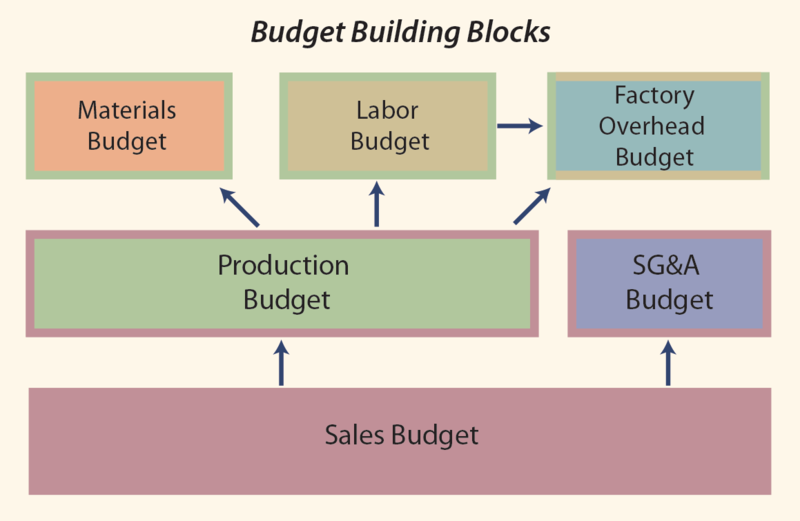 The accompanying graphic is a simplified illustration of these budget building blocks. The planned business activities must be considered in terms of their cash flow and financial statement impacts. It is quite easy to plan production that can outstrip the resources of a company. In addition, a business should develop plans that have a successful outcome; the budgeted financial statements are key measures of that objective. It would be very easy to expand the illustration to reflect additional interactions and budgets (e.g., the coordination of a long-term capital spending budget). Comprehensive budgeting entails coordination and interconnection of various components. 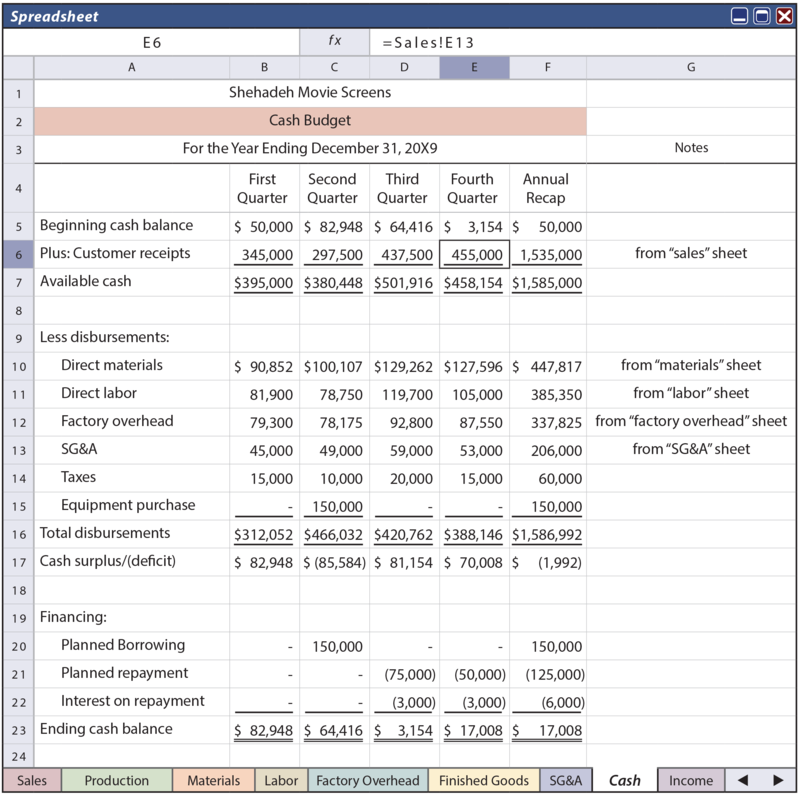 Electronic spreadsheets are useful in compiling a budget. If care is used in constructing the embedded formulas, it becomes very easy to amend the budget to examine the impact of different assumptions about sales, sales price, expenses, and so forth. The budgeting process usually begins with a sales budget. The sales budget reflects forecasted sales volume and is influenced by previous sales patterns, current and expected economic conditions, activities of competitors, and so forth. The sales budget is complemented by an analysis of the resulting expected cash collections. Sales often occur on account, so there can be a delay between the time of a sale and the actual conversion of the transaction to cash. For the budget to be useful, careful consideration must also be given to the timing and pattern of cash collections. Mezan Shehadeh recently perfected a low-cost vinyl product that was very durable and could be used outdoors in conjunction with rear-screen projection equipment. This product enables movie theaters to replace the usual lettered signs with actual videos to promote the “now showing” movies. Mezan’s company, Shehadeh Movie Screens, is rapidly growing. The sales budget for 20X9 follows. Review the sales budget closely, noting the expected pattern of sales. The fall and winter seasons are typically the best for the release of new movies, and the anticipated pattern of screen sales aligns with this industry-wide business cycle. The screens are sold through a network of dealers/installers at a very low price point of $175 per unit. Note that the lower portion of the sales budget converts the expected sales to expected collections. Shehadeh’s dealers are normally given credit terms of 30 days, and the result is that roughly two-thirds of sales are collected in the same quarter as the sale itself. The other third is collected in the following quarter. Shehadeh started 20X9 with $100,000 in receivables, which is assumed to be collected in the first quarter of 20X9. Shehadeh’s dealer network has been carefully selected and the company has very few problems with late payments or uncollectible accounts. 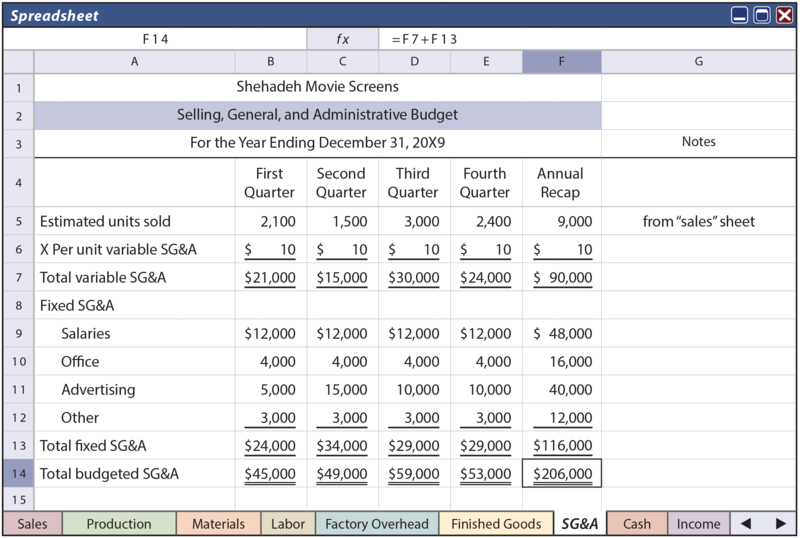 Shehadeh will end the year with $140,000 in receivables, determined as one-third of the final quarter’s expected sales ($420,000 X 1/3 = $140,000). Sales drive the level of production. Production is also a function of the beginning finished goods inventory and the desired ending finished goods inventory. 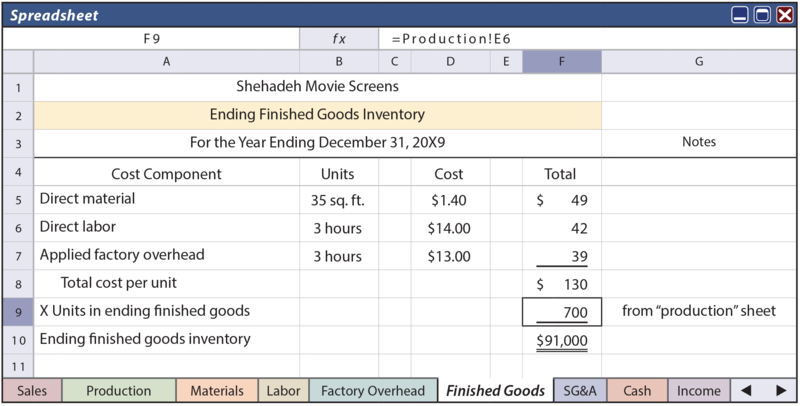 The budgeted units of production can be calculated as the number of units sold, plus the desired ending finished goods inventory, minus the beginning finished goods inventory. In planning production, one must give careful consideration to the productive capacity, availability of raw materials, and similar considerations. 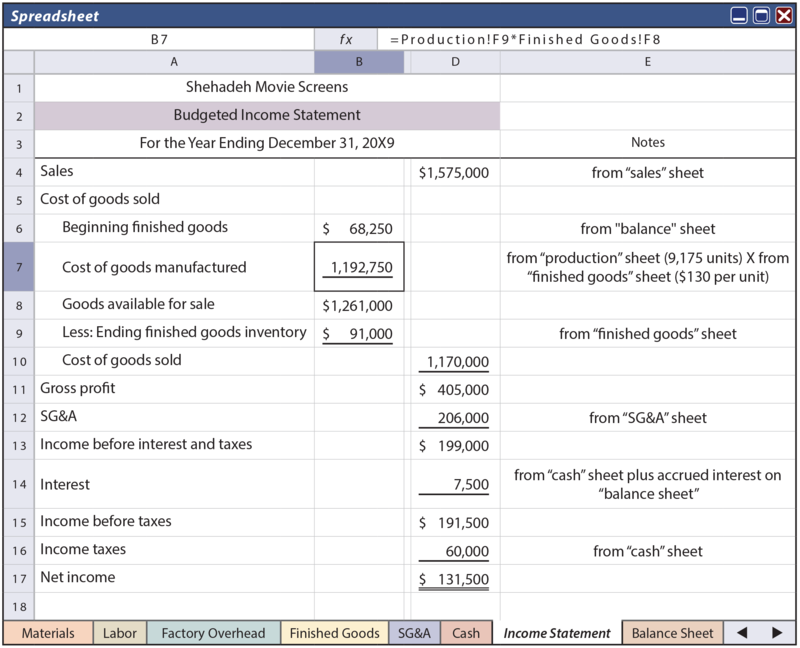 Next is the production budget of Shehadeh Movie Screens. Shehadeh plans to end each quarter with sufficient inventory to cover 25% of the following quarter’s planned sales. Shehadeh started the new year with 525 units in stock, and planned to end the year with 700 units in stock. Following is a quarter-by-quarter determination of the necessary production. Carefully examine this information, paying very close attention to how each quarter’s desired ending finished goods can be tied to the following quarter’s planned sales. In case it is not obvious, the estimated units sold information was taken from the sales budget; utilizing the power of the spreadsheet, the values in the cells on row 5 of this Production sheet were simply taken from the corresponding values in row 5 of the Sales sheet (“=Sales!B5”, “=Sales!C5”, etc.). Each movie screen requires 35 square feet of raw material. For example, the scheduled production of 1,875 units for the second quarter will require 65,625 square feet of raw material. Shehadeh maintains raw material inventory equal to 20% of the following quarter’s production needs. Thus, Shehadeh plans to start the second quarter with 13,125 square feet (65,625 X 20%) and end the quarter with 19,950 square feet (99,750 X 20%). Budgeted purchases can be calculated as direct materials needed in planned production, plus the desired ending direct material inventory, minus the beginning direct materials inventory (65,625 + 19,950 – 13,125 = 72,450). This fundamental calculation is repeated for each quarter. The upper portion of the following Materials spreadsheet illustrates these calculations. Once again, the electronic spreadsheet draws data from preceding sheets via embedded links. The direct material purchases budget provides the necessary framework to plan cash payments for materials. The lower portion of the spreadsheet shows that the raw material is slated to cost $1.40 per square foot. Shehadeh pays for 80% of each quarter’s purchases in the quarter of purchase. The remaining 20% is paid in the following period. The direct materials budget also reveals a planned end of year inventory of 19,600 square feet, which has a cost of $27,440 (19,600 X $1.40). As shown later, this value will also be needed to prepare the budgeted ending balance sheet. The direct labor budget provides the framework for planning staffing needs and costs. Each of Shehadeh’s screens requires three direct labor hours to produce. As revealed by the Labor sheet, the scheduled production is multiplied by the number of hours necessary to produce each unit. The resulting total direct labor hours are multiplied by the expected hourly cost of labor. Shehadeh assumes that the cost of direct labor will be funded in the quarter incurred. The factory overhead budget applies overhead based on direct labor hours. Based on an analysis, the annual factory overhead is anticipated at a fixed amount of $220,200, plus $5 per direct labor hour. The fixed portion includes depreciation of $3,000 per quarter for the first half of the year and $7,000 per quarter for the last half of the year (the increase is due to a planned purchase of equipment at the end of the second quarter). The bottom portion of the budget reconciles the total factory overhead with the cash paid for overhead (depreciation is subtracted because it is a noncash expense). The direct labor hours used in the Factory Overhead sheet are drawn from the Direct Labor budget. Further, the sidebar notes also indicate that the average overhead rate (fixed and variable together, applied to the total labor hours for the year) is $13 per hour. This information is useful in assigning costs to ending inventory. 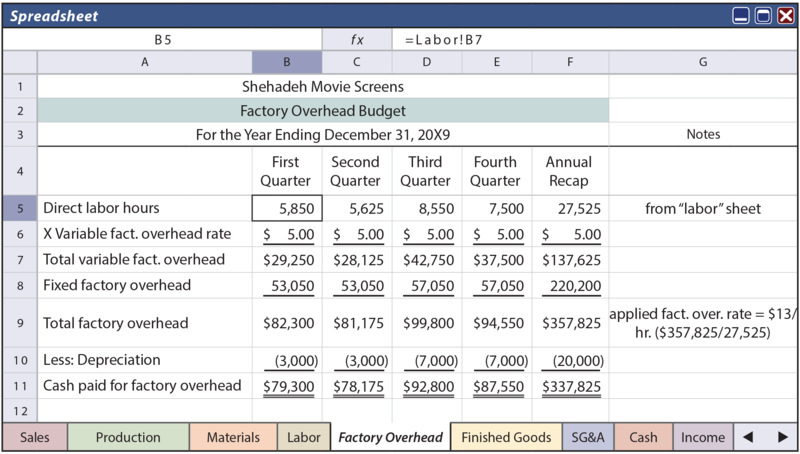 Assuming an average-cost method, ending finished goods inventory can be valued as shown on the Finished Goods spreadsheet. Companies must also plan an SG&A budget. SG&A consists of variable and fixed components. The expected quarterly sales are multiplied by the variable cost per unit. Most fixed items will be the same each quarter, although some fixed costs, such as an advertising campaign, can fluctuate periodically. Cash is an essential resource. Without an adequate supply of cash to meet obligations as they come due, a business will quickly crash. Even the most successful businesses can get caught by cash crunches attributable to delays in collecting receivables, capital expenditures, and so on. 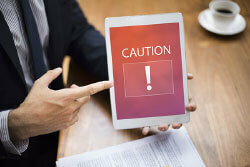 These types of cash crises can usually be avoided. The cash budget provides the necessary tool to anticipate cash receipts and disbursements, along with planned borrowings and repayments. Shehadeh’s cash budget follows. In reviewing this document, notice that the data in most rows are drawn from earlier budget components (the beginning of year cash is assumed to be $50,000). The cash received from customers is taken from the Sales spreadsheet, the cash paid for materials is taken from the Materials spreadsheet, and so on. The tax information is assumed; usually a tax accountant would perform an extensive analysis of the overall plan and provide this anticipated data. As mentioned earlier, it is also assumed that Shehadeh is planning to purchase new production equipment at the end of the second quarter, as shown on row 15. Look carefully at the Cash budget, and notice that the company is on track to end the second quarter with a cash deficit of $85,584 (before financing activities). To offset this problem, Shehadeh plans to borrow $150,000 at the beginning of the quarter. Much of this borrowing will be repaid from the positive cash flow that is anticipated by the end of the third and fourth quarters, but the company will still end the year with a $25,000 debt ($150,000 – $75,000 – $50,000). Interest on the borrowing is calculated at 8% per year, with the interest payment coinciding with the repayment of principal (i.e., $75,000 X 8% X 6/12 = $3,000; $50,000 X 8% X 9/12 = $3,000). Take note that accrued interest at the end of the year will relate to the unpaid debt of $25,000 ($25,000 X 8% X 9/12 = $1,500); this will be included in the subsequent income statement and balance sheet, but does not consume cash during 20X9. Each of the budgets/worksheets presented thus far are important in their own right. They will guide numerous operating decisions about raw materials acquisition, staffing, and so forth. But, at this point, it is very difficult to assess the success or failure of Shehadeh’s plans! It is essential that all of these individual budgets be drawn together into a set of reports that provides for outcome assessments. This part of the budgeting process will result in the development of pro forma financial statements. 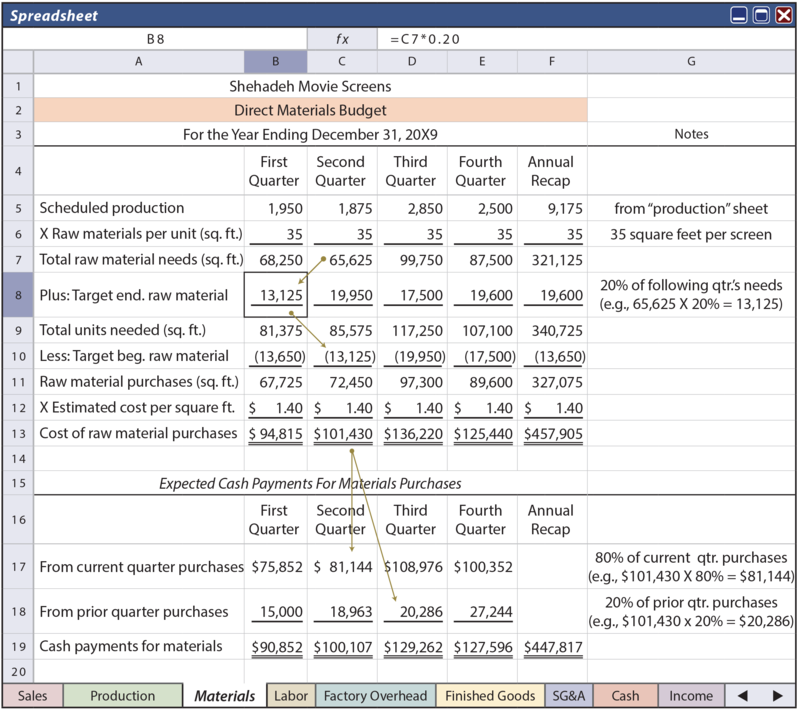 Almost every item in the budgeted income statement is drawn directly from another element of the master budget, as identified in the “notes” column. The following budgeted balance sheet includes columns for 20X9 and 20X8. The 20X8 data are assumed. The 20X9 amounts are logically deduced by reference to the beginning balances and information found in the details of the master budget. The notes in column H are intended to help one trace the resulting 20X9 balance for each account. For example, ending accounts receivable of $140,000 would relate to the uncollected sales during the fourth quarter ($420,000 sales – $280,000 collected = $140,000), found on the Sales sheet. 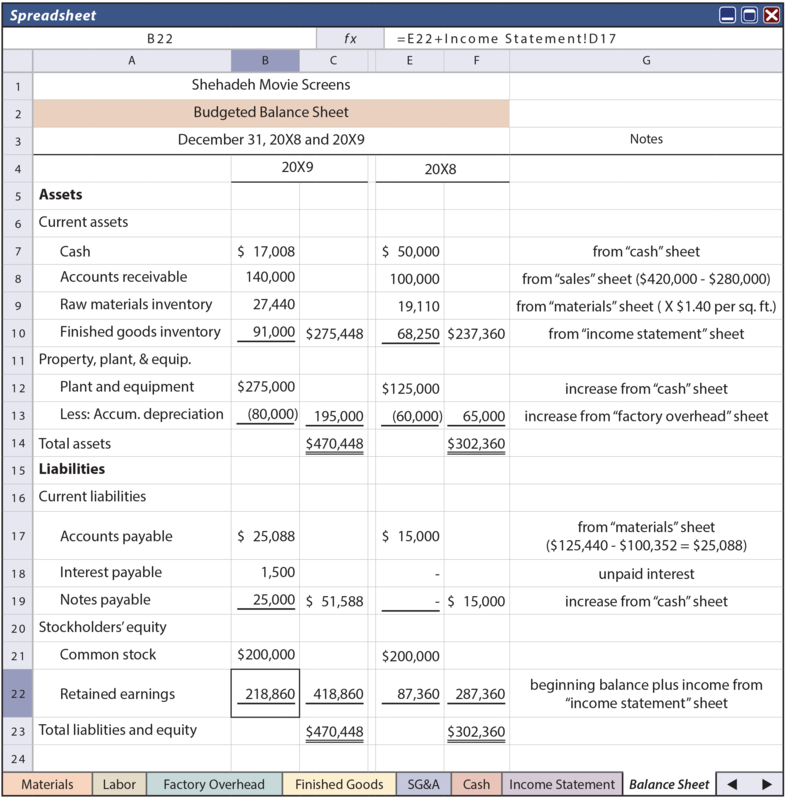 Projected financial statements are often requested by external financial statement users. Lenders, potential investors, and others have a keen interest in such information. While these documents are very common and heavily used for internal planning purposes, great care must be taken in allowing them to be viewed by persons outside of the entity. 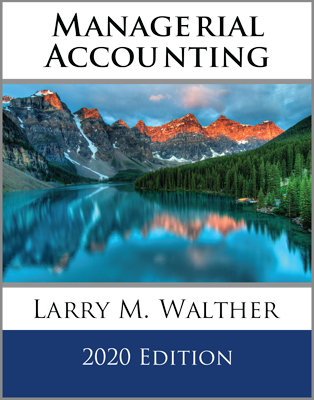 The accountant who is involved with external use reports has a duty to utilize appropriate care in preparing them; there must be a reasonable basis for the underlying assumptions. In addition, professional standards dictate the reporting that must accompany such reports if they are to be released for external use. Those reporting standards become fairly complex, and the specifics will depend on the nature of external use. 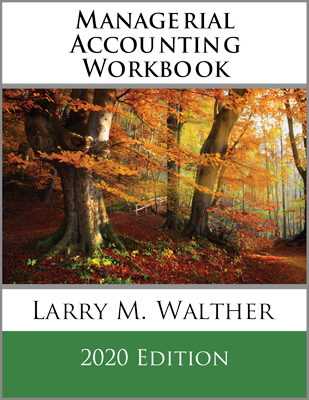 But, those reports will necessarily include language that makes it very clear that the participating accountant is not certifying their achievability. This chapter has made several references to the fact that budgets will be used for performance evaluations. Actual results will be compared to budgeted results. These comparisons will help identify strengths and weaknesses, areas for improvements, and potential staffing changes. But, the process for performance appraisal is far more complex than simply comparing budget to actual results. Much of the next chapter is devoted to this subject. Cite the components typically included in a master budget. What should be the starting point for budget preparation? 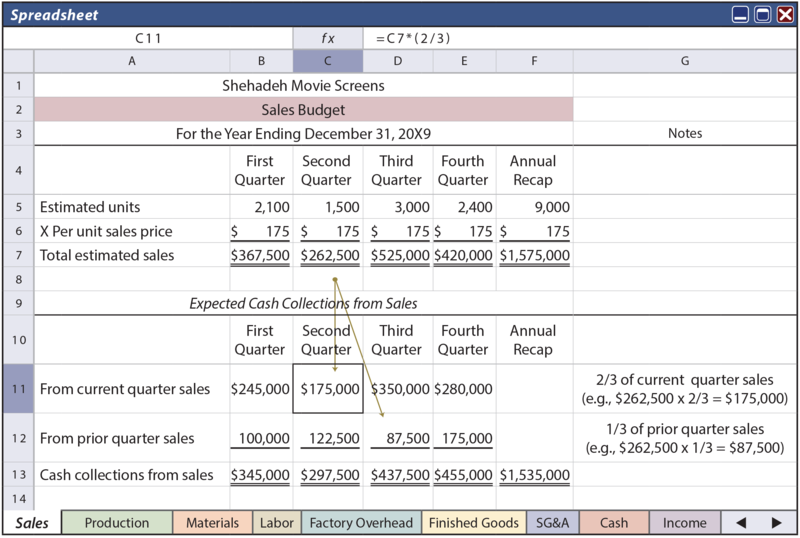 What is the advantage of an electronic spreadsheet in the budgeting process? 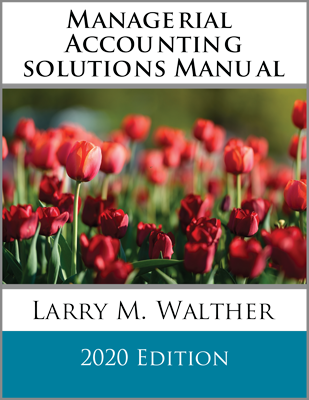 Understand and be able to prepare a sales budget, production budget, direct materials purchases budget, direct labor budget, factory overhead budget, selling and administrative expense budget, cash budget, and budgeted income statement and balance sheet. Understand why it is important to control external distribution of budgetary information.